Sorensen’s disappointment is better understood with a glance at Barack Obama’s inaugural address, that fails miserably with an obvious attempt to copy the poetic effects of Kennedy’s inaugural speech, for which Sorensen deserves much of the artistic credit. 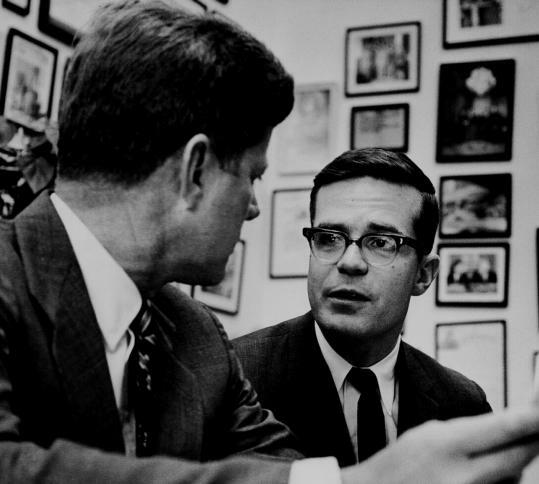 Describing the substance of Kennedy’s rhetoric, Sorensen was modest. He only admitted to collecting phrases and analyzing speeches from the past, like “the secret of Lincoln’s Gettysburg Address,” while stubbornly refusing to acknowledge his own contribution to the New Frontier’s exhilarating style. Accuracy, not modesty or loyalty, compels me to emphasize once again that John Kennedy was the true author of all of his speeches and writings. They set forth his ideas and ideals, his decisions and policies, his knowledge of history and politics. Every speech put his career on the line, reflecting choices for which he would be praised or blamed. The substance and style of Ted Sorensen will always offer hope and renewal. Theodore C. Sorensen, Why I Am a Democrat (New York: Henry Holt, 1996). Theodore C. Sorensen, ed., Let the Word Go Forth: The Speeches, Statements, and Writings of John F. Kennedy, 1947 to 1963 (New York: Delacorte Press, 1988). Miller Williams, Patterns of Poetry: An Encyclopedia of Forms (Baton Rouge: Louisiana State University Press, 1986).